We bring our brand new CodeTwo email signature integration to you today. 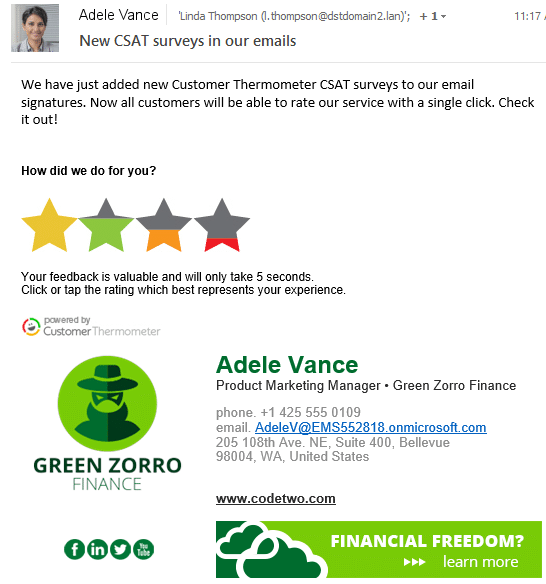 This quick and incredibly powerful integration allows CodeTwo users to automatically add Customer Thermometer’s 1-click feedback surveys to any emails they send. Add smileys, stars and icons into the email signatures added to your email by CodeTwo. Your email recipients can then click once to rate your email, service, experience – whatever you like (and a comment if they wish). Customers’ ratings and comments are logged instantly and tracked directly back to real recipients and team data. Trigger alerts to management in the event of unhappy customers. Rescue at-risk accounts and clients. See league tables of feedback ordered by employee/agent etc. Measure your NPS® score by agent, department, anything. If you’ve got CodeTwo, you can be up and running in under 5 minutes. Signature surveys will be automatically added. Setup is achieved in three simple steps. First, chose icons, customize your comment capture page and more to create your survey in Customer Thermometer. Save and off you go! your surveys will be automatically added to emails sent with that template. And you can track who clicked what! Full set up details are in our user guide. 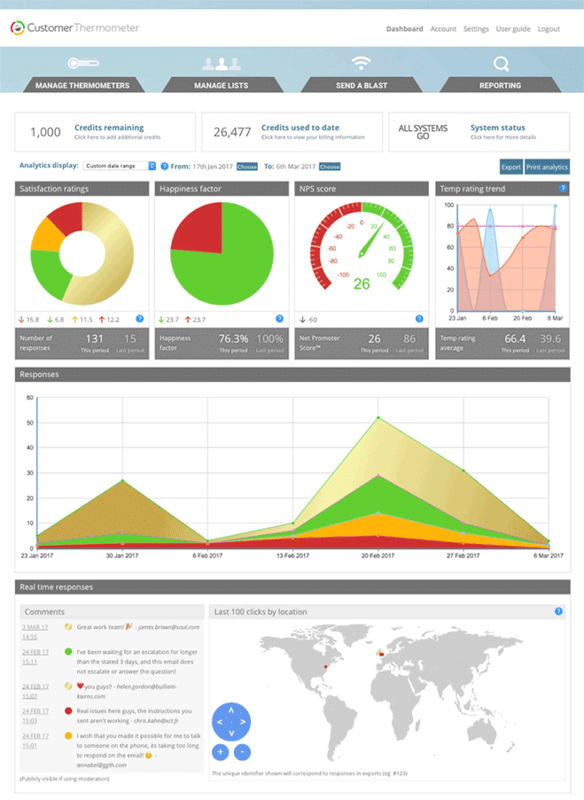 All customer feedback is captured in real time within your Customer Thermometer account. Need to get more customer feedback on the quality of the emails your team are sending? Give Customer Thermometer + CodeTwo a spin. Read more about the new integration here. Want a rundown on how to connect the two apps? Here are the integration instructions. Already a CodeTwo customer? Read more on their website.